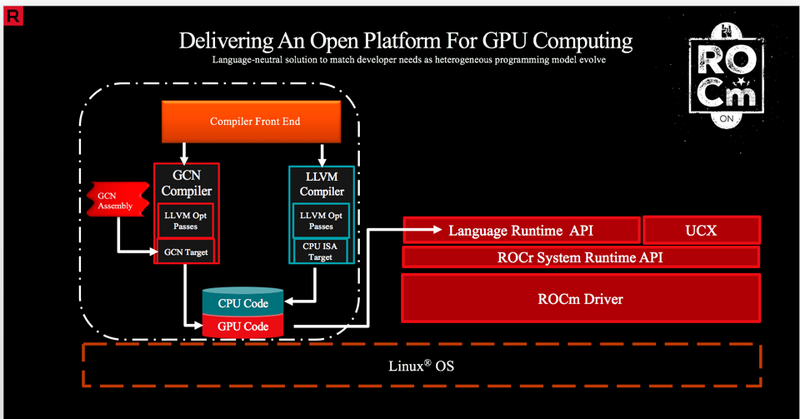 We are excited to present ROCm, the first open-source HPC/Hyperscale-class platform for GPU computing that’s also programming-language independent. We are bringing the UNIX philosophy of choice, minimalism and modular software development to GPU computing. The new ROCm foundation lets you choose or even develop tools and a language run time for your application. ROCm is built for scale; it supports multi-GPU computing in and out of server-node communication through RDMA. It also simplifies the stack when the driver directly incorporates RDMA peer-sync support. ROCm has a rich system run time with the critical features that large-scale application, compiler and language-run-time development requires. The ROCr System Runtime is language independent and makes heavy use of the Heterogeneous System Architecture (HSA) Runtime API. This approach provides a rich foundation to exectute programming languages such as HCC C++ and HIP, the Khronos Group’s OpenCL, and Continum’s Anaconda Python. The frontiers of what you can accomplish with ROCm are vast and uncharted. We look forward to working with you to improve the platform so you can use it more effectively in your own projects. Our efforts have opened the door to unique heterogeneous-computing applications that explore what this growing technology can do.